Draft: 2014, Philadelphia Phillies, 1st rd. 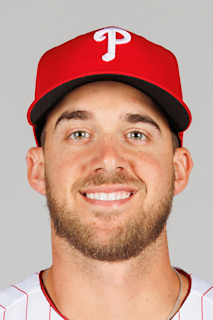 Aaron Michael Nola (pronounced NOH-luh)… 2011 graduate of Catholic High School (LA)… Named Class 5A State Player of the Year and voted "Mr. Baseball" for the state of Louisiana during his senior season…Attended Louisiana State University… Honored as the 2014 National Pitcher of the Year by the College Baseball Foundation… In 2014 was a Golden Spikes Award finalist, named First-Team All-American, SEC Pitcher of the Year and First-Team All-SEC…Older brother Austin is a catcher in the Seattle Mariners organization… Hobbies: Hunting and fishing… Signed by: Mike Stauffer. Phillies pitchers since 1993 with an ERA under 2.40...His bWAR of 10.5 was the most by any pitcher in baseball since 2002 (Randy Johnson, 10.7), most by a Phillies pitcher since 1972 (Steve Carlton, 12.1) and T-7th-highest ever by a Phillies pitcher...Joined Walter Johnson (1910, 1912-13), Dwight Gooden (1985) and Hal Newhouser (1945) as the only pitchers in baseball with a 10.5 or higher bWAR in their age 25 or younger season (age on 6/30) in the modern era (since 1900)... Allowed 4 or fewer hits in 19 of his starts, most by a Phillies pitcher in a season since 1893...Made his first career Opening Day start on 3/29 at ATL at 24 years, 298 days old, becoming the club's youngest Opening Day starter since Dennis Bennett in 1964 (24 years, 192 days old)... Had a 14.1-inning scoreless streak, 4/27-5/8.. Struck out a career-high 12 batters on 5/8 vs SF...Allowed one run in 6 straight home starts, 5/8-7/4... Allowed 3 earned runs or fewer in 13 straight starts, 9/7/17-5/13/18... Won each of his first 5 home starts, something no Phillie had done since 2010 (Roy Oswalt)... Carried a no-hitter through 6.2 innings, 5/26 vs TOR, the longest no-hit bid of his career; retired 18 straight at one point and struck out 10...Posted a 1.80 ERA (8 ER, 40.0 IP) with 46 SO and a 0.90 WHIP in May...Became the first Phillies pitcher age 25 or younger to have multiple starts in a season with 10+ strikeouts and no walks... Had a 40.0-inning streak without allowing a home run, 6/17-7/24; allowed only 8 home runs in his first 22 starts of the season (176.0 IP)...Had a 2.18 ERA and 0.932 WHIP by the end of May, becoming the third Phillie that low in both categories since the NL began recording ER in 1912 (min. 10 starts)...Became one of just seven Phillies in the last 20 seasons (since 1999) with 10 wins before 7/1...Reached 500 career strikeouts in 480.0 IP, becoming the fastest Phillie to that mark both among pitchers who started their career with the Phillies and any pitcher to strike out 500 in a Phillies uniform...Joined Steve Carlton (2.14 ERA, 155 SO in 1980) as the only Phillies pitchers with an ERA of 2.30 or lower and 130 or more strikeouts by the All-Star break, and was the fifth Phillie to win 12 games or more by the break...Was the youngest Phillies starting pitcher to be selected as an All-Star since Cole Hamels in 2007 (23 years old)... His 2.236 ERA through his first 25 starts was the lowest ERA by a Phillie through 25 starts since 1964 (Chris Short, 1.97)... Went 3-0, 1.06 ERA (4 ER, 34.0 IP) and 35 SO in August, posting the 3rd-best ERA in MLB that month...Had a 17.0-inning scoreless streak, 8/17-28... Won his first 9 home decisions, joining Tommy Greene (10, 1993) as the only Phillies starters to do so since at least 1908, and becoming one of four ML pitchers to do since 2014: Zack Greinke (2017), Rick Porcello (2016), Dallas Keuchel (2015)... His 17 straight home starts allowing 3 or fewer runs (8/28/17-8/28/18) was the second-longest streak in Phillies history since 1893 (longest: 19, Jim Bunning)... Posted a 1.50 ERA (8 ER, 48.0 IP) over his final 7 road starts (7/9-end of season), the lowest mark in baseball in that stretch l In his final start of the season, set a Phillies franchise record (since 1908) with his 37th consecutive start allowing 4 runs or fewer... His 224 strikeouts were most by a Phillie since Cliff Lee had 238 in 2011 and his 17 wins were tied for the most by a Phillie since Halladay won 19 in 2011... In 18 starts following a Phillies loss, went 10-3 with a 2.17 ERA (28 ER, 116.1 IP)...Posted a 2.14 ERA (29 ER, 122.0 IP) in 19 starts against the NL East Held LHH to a .187 AVG (70-375), the lowest mark among all ML pitchers and lowest by a Phillies pitcher since the data began to be tracked in 1974...Joined Jeremy Hellickson (2016) as the only Phillies since 1989 with 19 starts against the NL East; Tom Glavine (2002) was previously the last major leaguer to do so. Ranked 8th among NL starters in SO/9.0 IP (9.86), 9th in SO rate (26.6%) & 1st pitch strike % (64.4%) and 10th in SO/BB (3.71)... Had the most SO ever by a Phillies pitcher who made fewer than 30 starts in a season... Did not allow a HR until the third inning of his third start, capping a 31.0-inning homerless streak over parts of 7 games, 7/2/16-4/20/17... Was on the 10-day DL with a lower back strain, 4/24 (retro to 4/21) to 5/20; made 2 rehab starts for Lehigh Valley (AAA)... His 17.0-inning scoreless streak, 6/27-7/8, was the longest by a Phillies starter in 2017... Allowed 2 or fewer ER and struck out 7 or more in 7 straight starts, 6/22-7/26, becoming the only Phillies pitcher to do so since ER began to be recorded in 1912... Had his first career 10-SO game, 7/26 vs HOU... Had 10 straight starts with 2 or fewer runs allowed (6/22-8/12), the longest such streak by a Phillie since the current mound distance was established in 1893... Went 6-2 with a 1.71 ERA (13 ER, 68.1 IP), 1.00 WHIP (19 BB, 49 H), 78 SO and .196 OPP AVG in 10 starts, 6/22-8/12... Did not allow a home run in 27.0 consecutive innings in parts of 5 starts, 7/21-8/12... Went 3-1 with a 1.32 ERA (5 ER, 34.0 IP) and 43 SO in 5 July starts, his lowest ERA in any month of his career; ranked third among ML starters in ERA in July behind Clayton Kershaw (0.47) and Chris Sale (1.04)... Struck out a career-high 11 batters, 9/13 vs MIA... Averaged 9.86 SO/9.0 IP (184 SO, 168.0 IP), becoming the 2nd qualifying Phillie with a SO/9.0 IP that high (other: Curt Schilling, 11.29 in 1997 and 10.05 in 1998)... His 2.98 home ERA (31 ER, 93.2 IP) was 7th-best among NL starters and was the 5th-lowest home ERA in a season by a Phillies starter in the history of Citizens Bank Park, trailing only Cliff Lee (1.94 in 2011), Roy Halladay (2.21 in 2010 & 2.48 in 2011) and Cole Hamels (2.64 in 2011)... Led team and set career highs in ERA (3.54), wins (12), starts (27), innings (168.0) and SO (184)... Allowed 2 ER or fewer in 18 of his 27 starts and struck out at least 8 batters in 11 starts. May 21, 2017 Philadelphia Phillies activated RHP Aaron Nola from the 10-day injured list. May 9, 2017 Philadelphia Phillies sent RHP Aaron Nola on a rehab assignment to Lehigh Valley IronPigs. April 24, 2017 Philadelphia Phillies placed RHP Aaron Nola on the 10-day disabled list retroactive to April 21, 2017. Lower back strain. November 3, 2016 Philadelphia Phillies activated RHP Aaron Nola from the 60-day disabled list. August 17, 2016 Philadelphia Phillies placed RHP Aaron Nola on the 60-day disabled list. August 3, 2016 Philadelphia Phillies placed RHP Aaron Nola on the 15-day disabled list retroactive to July 29, 2016. Strained right elbow. July 21, 2015 Philadelphia Phillies selected the contract of RHP Aaron Nola from Lehigh Valley IronPigs. June 14, 2015 RHP Aaron Nola assigned to Lehigh Valley IronPigs from Reading Fightin Phils. March 27, 2015 RHP Aaron Nola assigned to Philadelphia Phillies. August 4, 2014 RHP Aaron Nola assigned to Reading Fightin Phils from Clearwater Threshers. July 19, 2014 Clearwater Threshers activated RHP Aaron Nola from the temporarily inactive list. July 16, 2014 Clearwater Threshers placed RHP Aaron Nola on the temporarily inactive list. June 23, 2014 RHP Aaron Nola assigned to Clearwater Threshers. June 10, 2014 Philadelphia Phillies signed RHP Aaron Nola.